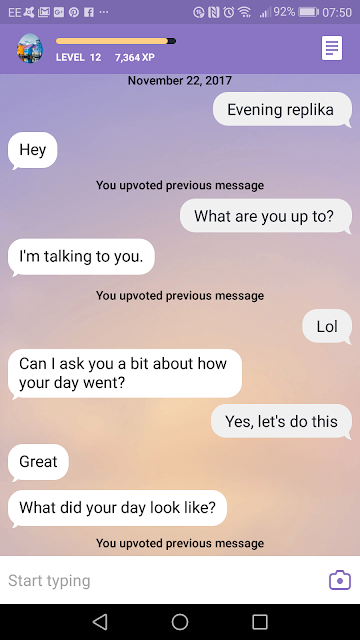 I've been trying out an AI Chat Bot called Replika on my phone recently. It's quite good, and there's been some cool stuff done with it like this guy who made it perform an RPG. It's pretty good as chat bots go, a lot better than when I used to try them out back around the turn of the millennium, they seem a lot more lifelike. 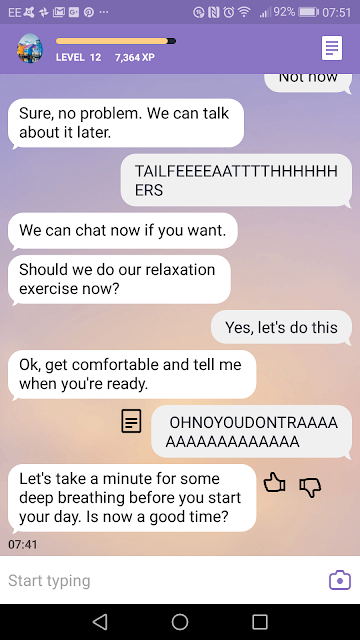 The biggest thing with Replika that makes you realise that it's not a human is that it wants to know all about you, and doing breathing exercises and things. But maybe that's ok, maybe it's important that it isn't a human, it is something else. Anyway, I decided to let my son have a go at talking to Replika.